Lucille Reilly (www.thedulcimerlady.com), 3x International Autoharp Champion, and 3x Mountain Laurel Autoharp Champion, is well regarded by folk- and classical-music colleagues alike as a consummate musician and lively entertainer regardless of the instrument (autoharp, hammered dulcimer, recorders and voice). Lucille brings a wealth of teaching experience and wisdom to all autoharpists, all with endearing humor and an easy, engaging instructional approach. She teaches at home in metro Denver, Colorado to local students, offers “B&B” lessons to out-of-state students, and teaches around the world via webcam. In addition to performing and serving as a workshop leader at the major U. S. autoharp festivals, Lucille leads small-group, three-day Autoharp Retreats, designed to help all autoharpists tap into the autoharp’s rich yet often unrealized orchestral potential as a solo instrument. Lucille has three CDs to her credit (one of them on hammered dulcimer). 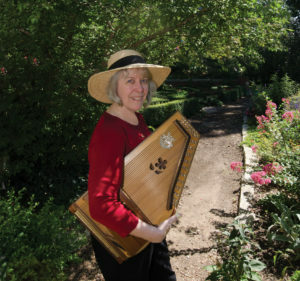 She is the author of Chords Aplenty, an autoharp chord-reference book, and a monograph series devoted to various aspects of Chord-and-Release autoharping. She writes “The Diatonic Corner” for Autoharp Quarterly magazine, and just in case you are wondering, she owns nine custom autoharps, most of them diatonic.